Music for those who love the wilderness and the natural world, this folk style Earth-music comes from America's foremost backcountry troubadour. 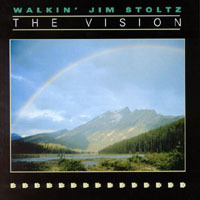 One of America's most unique folksingers and backcountry travelers, Walkin' Jim Stoltz, sings his songs with a definite sense of having been there. Indeed, he has. It all began innocently enough, walking the Appalachian Trail from Georgia to Maine. Then, after a year and a half spent walking from the Atlantic to the Pacific, folks just naturally started referring to him as "Walkin' Jim". What followed was years of annual long walks across the remaining wildlands of America including three different treks from Mexico to Canada and a Yellowstone to Yukon hike. It all adds up to well over 27,000 miles and dozens of songs, stories and photographs. Jim often carries a guitar and writes his songs as he walks through the wild places. His lyrics express a great love and respect for the Earth and the wilderness he knows so well. Known for his powerful baritone and emotion-packed vocals, he also spends part of each year touring (driving) across America performing his award-winning concert, Forever Wild. The show combines live music and poetry with stunning, multi-image slides. The mix of photographs and music results in a stirring celebration of wilderness. Stoltz is veteran of 30 years of performing and has been presented with the Environmental Protection Agency's, Outstanding Achievement Award for his sharing of nature and wilderness across America. Edward Abbey, the late author of many nature classics, described Stoltz as "a music man of exuberance and passion, with more to say in one song than Frank Sinatra ever managed in a whole bloody concert." Walkin' Jim is a co-founder of Musicians United to Sustain the Environment (M.U.S.E. ), www.musemusic.org , a non-profit organization using music to raise funds for wilderness and wildlife protection efforts. M.U.S.E. has released two compilation recordings featuring various nationally known artists. "Mr. Stoltz....sings in a deep bass that sounds like a distant rapid in a canyon stream. His songs are paeans to nature..."
"He is a true advocate for wilderness values and really affects his audience, if one has any sensitivity to nature and the outdoors. The first time I had him here, I was struck by an adult male coming up to him afterwards and telling of the tears he had during, and as a result of, his presentation. He is asked back again and again by various national outdoor and environmental groups for their annual meetings. To my knowledge, there is no one in the country doing exactly what "Walkin' Jim" does, in his combination of original poetry, music and photographs in the service of wilderness advocacy. I confess that I own most of his CD's!!" "It would be hard to find a better ambassador for wildlife and wild places." Great inspiration for these mournful days of Bush-antics! I have owned tapes and CD's by Walkin' Jim for almost 10 years now. When I feel that I am becoming disconnected from Earth, I just take a listen. The songs on this CD touch into my heart's passion for nature and renew my commitment to work for eco-justice. The music isn't political or preachy; it simply conveys the grace and grandour of our country beyond the Urban Sprawl accepted norm. In this day of 'in your face' grunge and urban fare glorifying violence, bigotry and concrete self-absorption, it's a respite to hear stories of the greater world far few of us take the time to explore -- particularly on foot. The music is about the Nature that's part of all of us, and Jim's voice brings it home.